The kids’ school had a Family Day affair last Saturday. It was like a fair wherein they prepared different games, catch a chick, ring a bottle, etc. There were also food booths and a Kalesa ride. I wasn’t able to take much pictures coz it was too hot to go around. But it was a good morning spent with the kids. Good thing the family day this year was a bit relaxing compared to last year. We had to do some wall climbing, obstacle course, and relays. So this time it was just a fun day at the park. 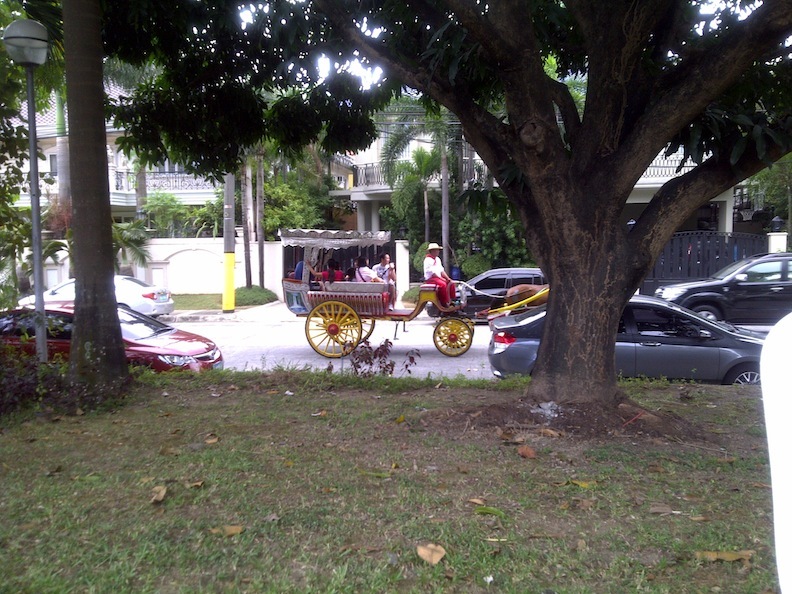 Here's Chesca and Rick riding the "princess carriage" as Chesca calls the Kalesa. We ended up bringing home some chicks even if the kids didn’t catch one. They actually were scared of them and didn’t want to take them home but a teacher gave us 2. They were with us for 3 days and we ended up giving them away for their (the chick’s) own safety 🙂 ….Rick put them in an empty aquarium, I knew that was gonna be too hot for them, then they’d poop like crazy! So good thing was, our neighbor wanted them. They’d take good care of the chicks better than we would. At least the kids were able to experience having a live pet in the house.